This week, I'm going to try something different. 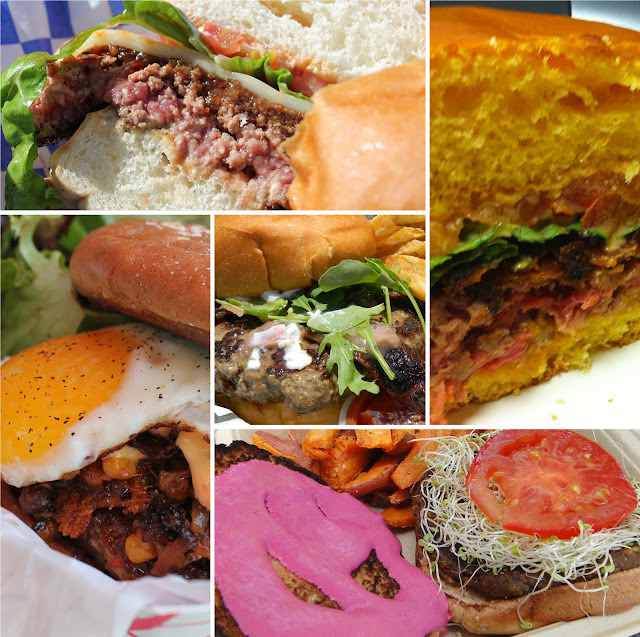 If there was one food that epitomizes the hunger that San Diegans have, it's the burger. While outsiders might think that San Diegans go crazy over the fish taco, the true food that all San Diegans love is the burger. It's so in demand that every restaurant has to have a burger on their menu. Temperature - weight: 1 - Because I love a juicy burger, when I ordered each of these burgers I ordered it "as rare as you're willing to go"
Sides - weight: 1 - Even if sides were not provided for free, I ordered a side with each burger, so here is the score of the sides that came with the burger. I've previously covered Devilicious in this blog, but since I last covered them, demand has them creating a new burger of the week every week for the menu. Additionally, since the last time I covered them, there has been some staffing changes. Chef Dyann Huffman Manning now fully owns and operates Devilicious while her husband Mark operates little brother truck Kalbiq. In the lower tier, we had The Gooch and Bitchin Burgers. Originally The Gooch offered tater tots with the burgers, which would have increased the value score, but since there were no tots, they fell out of competition. I also didn't order any sides from The Gooch, who perhaps needs to add some more compelling sides than just onion rings. The truck that needs the most work in my opinion is Bitchin Burgers. I feel like that truck is still trying to find its way as it originally started with burgers on ciabatta bread (luckily for me they moved beyond that), and now is mixing the cheese with the patty. Not only does this seem to lessen the serving size of the meat to the customer since it is measured to 1/3 lb, it also seemed to remove some of the juiciness of the burger. Ultimately the best food truck burger is the best burger on the truck you can find (or visits your area). Next time, I will examine the best burgers from fast food restaurants since those are fairly ubiquitous.